We’ve recently reviewed a few ladder ball sets and let me tell you, there certainly are some fine setups out there. 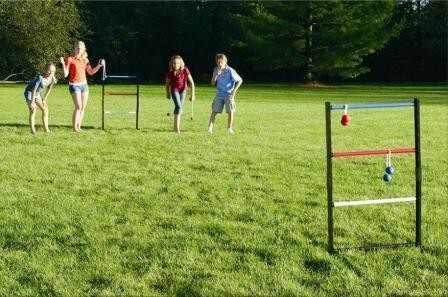 Our top recommendation among many available sets is the GoSports premium ladder toss game with 6 bolos. 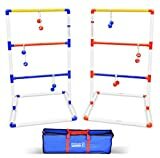 It comes with a solid carrying case and appears to be the best selling ladder toss at Amazon for quite some time now. You can check current price and further specs here. But maybe you’re cut from a different cloth, choosing to carve your own path. Perhaps you’re the DIY type, and think you can craft a set that is on par or better than anything you can buy. Well kudos to you, my friend, I applaud your resourcefulness. It’s your lucky day too, as I’m here to help you traverse through the process and provide you with a few tips and blueprints for crafting your own ladder ball set. All told, it doesn’t take too much effort, merely a little ingenuity and a trip down to your local hardware store. The next step is to cut your PVC pipe to spec. For the set measurements we are using you will need to cut: twelve 18” pieces (45 cm), eight 12” pieces (30.5 cm), and six 24” pieces (61 cm). The 18” pieces are those that are going to be used vertically, the “walls” of the set, if you will. The 12” pieces are those that will be used to build the base of the set. The 24” pieces are those that will be used as the horizontal pieces, the rungs of the set. Once you’ve done all of that you can dust your hands off, pop a cold one, and head outdoors with your new set to give her a whirl. In all honesty, this is a fair straightforward guide to a fairly straightforward bit of craftsmanship. It’s something you should be able to complete in an afternoon with a few of your pals. The important part is that you enjoy the fruits of your labour. Get out while the sun is still shining!